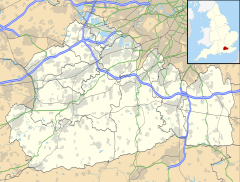 Charlwood is a village and civil parish in the Mole Valley district of Surrey, England. It is immediately northwest of London Gatwick Airport in West Sussex, close west of Horley and north of Crawley. The historic county boundary between Surrey and Sussex ran to the south of Gatwick Airport. Boundaries were reformed in 1974 so that the county boundary between Surrey and West Sussex, delineated by the Sussex Border Path, now runs along the northern perimeter of the airport, and the southern extent of Charlwood. A narrow ridge of Sussex Marble runs through the west of the parish, where it is followed for a distance by the Sussex Border Path. Elevations range from 60 to 140m above sea level. No dual carriageways bisect the area and London Gatwick Airport has its perimeter immediately to the south-west. The village anciently lay within the Reigate Hundred. Its variant spellings from such medieval records as the feet of fines include: Cherlewude (13th century); Cherlwude (that century and the next, when Chorlwode also appeared). After this Charlewood appears commonly in 18th century records. The place is not mentioned in Domesday, and was probably a forest district of the manor of Merstham, Surrey which until shortly after 1911 reached into the parish. In the medieval period this was held by Christchurch Priory. About 1890 a vessel of Paludina Limestone (Sussex 'marble') was found on the estate of Mr. Young, Stan Hill/Stanhill, which the finders regarded as an ancient font, but which was perhaps a stone mortar. Charlwood Place is a 16th-century listed moated house situated on the northwestern perimeter of the village. The mother of John Pitseus, a recusant Bishop in France, lived there. Sir Richard Lechford, following a Lechford owner of 1567, conveyed the manor[which?] in 1625 to Edmund Jordan whose family held it until 1759. A descendant, John Sharp, succeeded[clarification needed] and held the property intact until 1806, when he sold the manors of Charlwood, Hook, in the parish and Shiremark in Capel to Thomas Kerr[relevant? – discuss]. A historic cricket match was held in Charlwood in June 1741. This was Surrey v London and won by the county team. The match is the only time that Charlwood features in surviving cricket records. Total enclosure (of the common land) took place in phases: in 1843, 1844 and 1854, including of Johnson's Common and White's Common, once considered infertile land. Lowfield Heath was in the parish and was enclosed in 1846. Charlwood's cottage hospital opened in 1873 but was closed in 1911. Charlwood Boys' School was built in 1840. Charlwood Girls' and Infants' School was built in 1852 and enlarged in 1893. Lowfield Heath School was built in 1868. Gatwick Racecourse, opened in 1891, after the closing of the Croydon Racecourse at Woodside, Croydon. Pursuant to the intentions of the Ministry for Local Government, a move of Charlwood under the Local Government Act 1974 from Surrey to West Sussex was underway that year, which was prevented from completing by a further act of parliament in the same year – the Charlwood and Horley Act 1974 – to ensure it stayed in Surrey. The village has more crown post timber-framed houses than any other village in Britain. Charlwood is in the Mole Valley District which co-administers local services with Surrey County Council. Additional local amenities are provided, with Hookwood, by its (civil) parish council. Charlwood's western limestone escarpment is the home of this windmill, which was moved from the village of Lowfield Heath when it was threatened with demolition in the 1970s, part of which took place to that village to accommodate Gatwick Airport's growth. St Nicholas's is a Grade I listed building with intact Norman era stones. It has a particularly historically significant series of murals on the south wall of the chancel, contemporary with the south aisle which has been dated as c. 1300. These include scenes from the story of St Margaret and St Nicholas, amongst others. Providence Chapel, a Grade II* listed building, stands on a lane to the north of the village. The weatherboarded single-storey building was re-erected there in 1816 after being moved from Horsham, where it served as an officers' mess during the Napoleonic Wars. It was used as a Nonconformist chapel for almost 200 years, but was put up for sale in 2012. The village is centred on the "rec", which comprises: a redeveloped children's playground, and the sports pitches of Charlwood F.C. who currently play Intermediate football in the Mid Sussex Championship, Sunday side Charlwood Village F.C. and of Ifield Cricket Club. The village used to have its 'own' cricket club (Charlwood C.C.) which for many years was seen playing on both Saturdays and Sundays on the green. In latter years the club only put out one side, on a Sunday, but managed to achieve the distinction of not losing a single game for more than three seasons (between 1989 and 1991), a record that still stands. The club closed in 2002 but its grounds are used in Summer by the replacement club described. The village has its own primary school, expanded from an infant school in 2016. Charlwood is also home to the John Bristow and Thomas Mason Trust, which has its earliest origins in Charlwood's first school established in the early 17th-century, This building is still intact and owned by the Trust. Charlwood has a small number of shops and two pubs; The Greyhound' and The Half Moon. A restaurant, Limes Bistro is in the settlement. Charlwood has two hotels in imposing buildings and numerous Bed and Breakfasts on its outskirts. Stanhill Court was built in 1881 as the home of William Young, one of the six signatories to the formation of Lloyd's of London by virtue of The Lloyds Act 1871. The exterior is classic Sussex brick and hanging tile, while the interior is in Scots' Baronial style using pitch pine. The fireplace surrounds are of polished Charlwood stone ( Paludina Limestone / Sussex Marble) quarried on the grounds. In 1986 the great grand daughter of Wm Young converted the building into an 11 bedroom hotel. In 1992 Stanhill Court Hotel was leased to Colas[who?] who purchased it in 1994 and subsequently increased the bedroom and function room capacity with an additional wing. The hotel has been awarded AA Most Romantic Hotel award. Glover's Wood, a Site of Special Scientific Interest is wholly within the west of Charlwood, and is noted for its bluebell displays in springtime. Gatwick Aviation Museum is on the north western perimeter of Gatwick Airport to the south east of the village. Hookwood 51°10′01″N 0°11′10″W﻿ / ﻿51.167°N 0.186°W﻿ / 51.167; -0.186 is a clustered semi-agricultural 'village' in many contemporary definitions which is to the east starting at the southern tip of the A217, between Charlwood's centre and Horley. Hookwood Common was mentioned as 'still open ground' by the county topographer H.E. Malden in 1911, in the relevant Victoria County History. He also records that the misses Sanders who co-owned Hookwood House belonged to the old Sanders family of Charlwood. It is the most projecting settled part of the parish and its nearest amenities are equidistant, either those of economically important Horley or the smaller, more traditional amenities of Charlwood. Russ Hill 51°08′56″N 0°14′28″W﻿ / ﻿51.149°N 0.241°W﻿ / 51.149; -0.241 is the area to the south west, a semi-agricultural and semi-wooded upland area which has the largest hotel in the civil parish of Charlwood. Reflecting its woodland, the statistical area extended to Norwood Hill (see below). Together these outlying parts had a population of 416 across 8.63 square kilometres (3.33 sq mi) as at the 2011 UK Census. The bending Charlwood to Rusper makes up the access to almost all properties making the neighbourhood a traditional linear settlement. Norwood Hill 51°10′37″N 0°13′37″W﻿ / ﻿51.177°N 0.227°W﻿ / 51.177; -0.227 is spread around a crossroads, closest to which is a pub. It is to the north and shares its single statistical output area with Russ Hill above.It has nearest access to the basic amenities of Charlwood in the same way, as well as the much larger amenities of Horley to the east of the parish in social and leisure and employment of Horley and the Borough of Crawley in terms of its economy other than farming and retirement properties which together accounted for a minority of the population as at the 2011 Census. The proportion of households in the civil parish which owned their home outright compares to the regional average of 35.1%. The proportion which owned their home with a loan compares to the regional average of 32.5%. The remaining % is made up of rented dwellings (plus a negligible % of households living rent-free). Donald Campbell may have been born at, and certainly lived at, Povey Cross in Hookwood at the eastern end of Charlwood parish. Charles Cardell lived at Dumbledene estate in Charlwood. Don Charlwood, Australian-born author and aviator, visited the village during the war and discovered that his ancestors were buried in the cemetery there. Billy Monger, British Formula 3 racing driver, survived a huge accident at Donnington Park in 2017, lost both of his lower legs. David Sheppard, Bishop of Liverpool, England cricket captain was brought up in Charlwood. ^ a b c d e f g h H.E. Malden, ed. (1911). "Parishes: Charlwood". A History of the County of Surrey: Volume 3. Institute of Historical Research. Retrieved 28 November 2013. ^ "Charlwood Place, Charlwood". British Listed Buildings. Retrieved 26 December 2016. ^ Waghorn, Cricket Scores, p. 26. ^ "The Charlwood and Horley Act 1974". OPSI. 8 February 1974. Retrieved 31 December 2008. ^ Historic England. "Lowfield Heath Windmill, Rectory Lane, Charlwood, Mole Valley, Surrey (430357)". Images of England. Retrieved 17 May 2008. ^ Historic England. "Details from listed building database (1248610)". National Heritage List for England. Retrieved 15 March 2012. ^ a b "Parishes – Charlwood | A History of the County of Surrey: Volume 3 (pp. 182–189)". British History Online. Retrieved 7 May 2012. ^ Stell, Christopher (2002). Nonconformist Chapels and Meeting-houses in Eastern England. Swindon: English Heritage. p. 320. ISBN 1-873592-50-7. ^ "Historic Grade II* Listed chapel – Providence Chapel, Chapel Road, Charlwood, Surrey RH6". D1 Space Property Finders. 29 August 2012. Archived from the original on 15 July 2013. Retrieved 15 July 2013. ^ Searle, Joshua (24 August 2015). "New primary school for Charlwood". Surrey Mirror. Archived from the original on 23 September 2015. Retrieved 13 March 2017. ^ "Providence Chapel". The Charlwood Society. Retrieved 13 March 2017. ^ "History of John Bristow's Charity". The John Bristow and Thomas Mason Trust. Archived from the original on 13 March 2017. Retrieved 13 March 2017. ^ a b Key Statistics: Population - More Areas - Output Areas. E00155715 (2011 census) Retrieved 17 April 2015. ^ "Donald Campbell". Retrieved 16 July 2013. ^ "History of Hookwood – Charlwood and Hookwood Surrey". Charlwood and Hookwood Parish Council. Retrieved 17 July 2013. Wikimedia Commons has media related to Charlwood. Surrey County Council. "Charlwood". Exploring Surrey's Past. Retrieved 30 May 2017. This page was last edited on 28 December 2018, at 00:45 (UTC).